In 1897, Millicent Fawcett organised the National Union of Women’s Suffrage Societies (NUWSS – the Suffragists) to campaign peacefully for the vote. In 1903, the Women’s Social and Political Union (WSPU – the Suffragettes) was formed, led by Emmeline Pankhurst. The Suffragettes used violent protest, famously breaking windows and chaining themselves to railings. Another group campaigning for the vote was the East London Federation of Suffragettes (1913), under Sylvia Pankhurst. Parliament rejected every bill to give women the vote. Male members held strong views about the weakness of women. The Women’s National Anti-Suffrage League (1908) campaigned againstvotes for women. When the First World War broke out, the Suffragettes and Suffragists stopped most of their campaign. 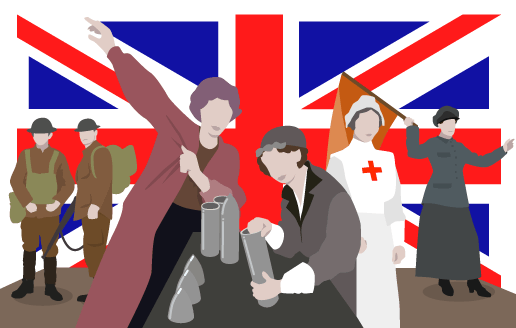 During the war women contributed greatly to the war effort, and kept the country going while the men were away. In 1918, the government passed the Representation of the People Act giving the vote to all men over the age of 21, and women over the age of 30 who were householders or married to a householder. The campaign for women’s suffrage finally succeeded in 1928, when women were granted exactly the same voting rights as men. 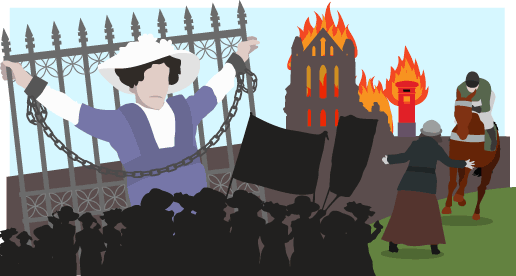 You can compare the Suffragettes’ movement to other violent protests, such as the Peasants’ Revolt and the Chartists. In 1903, the Women’s Social and Political Union (WSPU – the Suffragettes) was formed, led by Emmeline Pankhurst. It was run by Mrs Pankhurst and her daughter Christabel. In 1913, Emmeline Pankhurst declared that the WSPU were ‘guerrillists’, who would destroy anything other than human life to get the vote. In 1918 the Representation of the People Act gave the vote to all men over the age of 21, and women over the age of 30 who were householders or married to a householder. In 1928, women over the age of 21 were given the same voting rights as men. 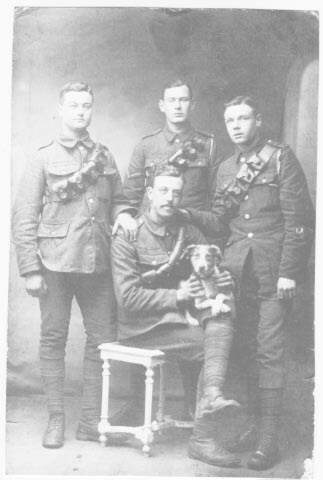 During the war, the NUWSS continued to write to MPs, asking for votes for women. Millions of working class men – including soldiers fighting in France – still did not have the vote. The government wanted to give them the vote, but they could not give men the vote and not women. In 1918, many of the ‘old guard’ MPs who had opposed votes for women had been replaced by younger men who supported it. Many bills were presented to Parliament between 1900 and 1914, but they were all defeated. In 1910, the Men’s National League for Opposing Women’s Franchise merged with the Women’s National Anti-Suffrage League to form the National League for Opposing Women’s Suffrage. It published the Anti-Suffrage Review, which said that women were not fit for government, and that Suffragettes neglected their families. In 1914, when the war broke out, Emmeline Pankhurst stopped the campaign, and urged women to support the war instead. The Suffragettes’ campaign might have won women the vote. Some historians believe that the real reason that the men in Parliament gave women the vote was because they were scared that the Suffragettes would restart their campaign of violent protest. MPs just used what women had done in the war as an excuse to do so. ‘Seen’ women. One of the problems with women in history is that so much of what they did is ‘unseen’. This was not true of the Suffragettes, who brought women’s rights to the public attention. The Seeds of feminism. The Pankhursts provided a strong example of women fighting for women’s rights. This has inspired feminists and women politicians ever since. However, it can be argued that the suffrage movement still has a little way to go. There were only 17 women candidates at the 1918 general election. Things had improved by 2010, but still only 143 of the 650 MPs were women, and there were only four women among the 23 ministers in the Cabinet. Many histories of the ‘fight for the vote’ are romantic accounts which celebrate the heroes of the movement who won the vote. Two of these books were written by Emmeline Pankhurst (1914) and Christabel Pankhurst (1959) themselves. This was the approach of the BBC TV series Shoulder to Shoulder (1974). A different approach was taken by Sylvia Pankhurst (1931). Sylvia portrayed her mother as bossy and unstable. For Sylvia, the vote was won in June 1914 by working class socialist women, led by her. For George Dangerfield (1935) the Suffragettes were just one, small symptom of a wider set of problems that were changing Britain at the time. Dangerfield belittled the Suffragettes as ‘hysterical’. This has been called the ‘masculinist’ approach. In the 1960s, feminist interpretations were written which saw the struggle for the vote as part of a wider struggle for female emancipation. Since 1970, revisionist writers have shifted attention from the Suffragettes to the ongoing, quieter, behind-the-scenes work of the suffragists. They have showed that the Suffragette movement was not all London and the Pankhursts and that many Suffragette actions were not spontaneous acts by the rank and file at all, but the work of WSPU employees and paid militants, acting under orders. Recently, the ‘New Women’s History’ movement has suggested that the struggle for the vote was not an important episode in women’s history. They concentrate instead on issues such as the female experience of life, and are much more interested in the ‘unseen’ role women played in developments, such as the rise of the Labour Party. What is your interpretation of the women’s suffrage campaign? 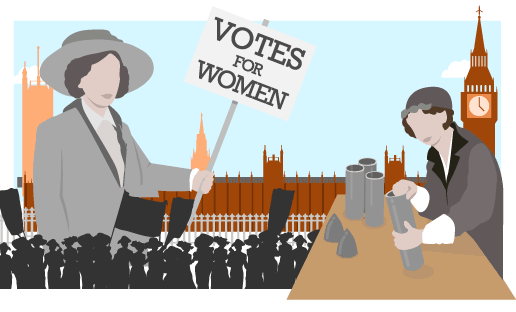 Who got the vote for women – the Suffragettes, the Suffragists, the ‘unseen’ women or was it given to them by the men? Was Suffragette violence justified? How do you view those who opposed women’s suffrage?